This flower always makes me think of 80’s acid house with it’s ridiculously bright flouro colours. This Kennedia, related to the Running Postman is the Kennedia coccinea (Curtis) Vent. 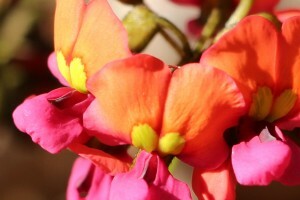 is one of a number of pea type flowers in the forest.